Find the best water dispensers on the market with Mzuri Products. The Water dispensers are slowly evolving, from the time they were invented; they are slowly becoming part of our lives. You can easily spot them at homes or even business areas. They not only dispense water, the water cooler dispensers are more than dispensing cold water. It performs other functions to make your life easier and more comfortable. They will provide you with cold water, hot water, and at times room temperature water. You can now get one for your home use. In this article we are going to look at the best water dispensers or best water cooler dispensers both for office and home use. Have you worked in an office for so many years, used the same water dispensers which is just metres away from your office chair or work station. It breaks down and told to replace it. There are many modern looking water cooler dispensers on the market that you can select. More so those that hide the water jug. Get a brand new water cooler dispenser that is well designed and gives you the functionality you need. Once you go through this article, you will find the best water dispenser to replace the old one for your office. If you are buying for the first time, you will get the best tips on which is best hot and cold water dispenser. Your clients and workmates will be happy about the new water cooler; it will be amazing to quench your thirst. A water dispenser or water cooler is a device that cools and dispenses water. Water dispensers are broken in two categories: bottled water coolers and bottleless Water dispensers. Why do you Need a Water Dispenser? There are many reasons why you need the best water dispenser for home use and office use. The main reasons being, to have the clean drinking water at the temperature you desire. It also gives you hot water for tea. Which water cooler is best? Below are some of the best water cooler on the market to purchase. Looking for a self cleaning water dispenser? This is one of the best water dispenser brand on the market, Whirlpool Self Cleaning Water Dispenser. If you want a classy and stainless steel look Water Dispenser, whirlpool stainless steel water cooler will give you the best results. It gives your office or home a classy look. Whirlpool Self Cleaning water dispenser uses 6th sense self cleaning technology. This technology uses unstable Oxygen to break down bacteria and viruses found in water. The end results is amazing, you will always have clean water for drinking. It contains LED indicators which shows when the Self Cleaning is running, and when the cold and hot water are at optimum temperature. It only gives freezing cold or boiling hot water. NewAir Pure Spring WAT40B BPA Free Hot and Cold Bottom Loading Water Dispenser is one of best rated water cooler dispenser on the market. Its reviews are highly positive. This Water Dispenser gives you the most convenient way to keep icy-cold and hot water close to you in your home or office. It enables you to get the water you need at any time. The dispenser is designed by a brand you can trust. It dispenses cool refreshing water on hot days and warm water for coffee and tea on cold days just the way you need it. The dispenser is equipped with a powerful energy efficient compressor. It cools water to as low as 39 Degree and heats it up to 185 Degree. It is lightweight compared to other models. This water top loading water cooler dispenser comes with amazing features. It dispenses hot and cold water. Comes with child safety lock to safeguard your child from any accidental burns and its design is well innovative. The water dispenser can hold 3 or 5 Gallon Bottles. It is also UL/Energy Star Approved. The Avalon dispenser is one of the best water dispenser for a home use. It is well designed to fit into a small space within your kitchen or living room. Easily blends into your home as it comes white in color. Ideal for cool refreshments or toasty beverages. 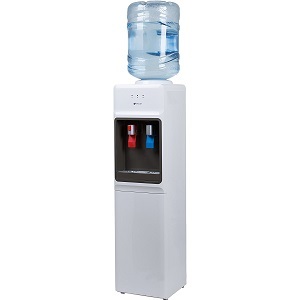 The Clover B14A hot and cold bottled water dispenser is perfect for office use. The dispenser serves refreshing chilled drinking water as well as piping hot water for soup, oatmeal, or hot beverages. The dispenser is made of one piece UV-protected high density polyethylene body. The double float valve with secondary safety float mechanism assists in reducing water loss from spilling. Clover B14A Water Dispenser comes with a hygienic stainless steel tank that helps to provide clean drinking water for your home or office. Makes the cold water between 35° to 53° F.
Clover B14A water dispenser requires little maintenance; remove the one piece ABS drip tray for occasional cleaning. This water dispenser will help you save a lot. It is easily movable and well designed. It powerfully filters regular tap water using Brita pitcher filters. Easy to Maintain as it is a self Cleaning dispenser.